It possibly the point of origin of the members of the Troll Associates. Saturnyne frequently resides with the Starlight Citadel, although she is not native to Otherworld. see also Features for other natives to related/connected realms. Momur (also spelled Magh Mor or called Tir Na Bog) which is ruled by Midir and is home for numerous elfin-like creatures. In myth, this realm was considered underground, but this may be because some portals to it from Earth were located there. Tir fo Thuinn, the under-sea home of Leir, the god of sea and storm (presumably the same Leir who is god of lightning and the spear). Tir inna mBan, a land of paradise populated by beautiful women who abducted mortals to be their husbands. Tir tairngiri, the Land Of Promise, ruled by Leir's son, Manannan where Bran the Second retired millennia ago. Annfwn, the Land of the Dead ruled by Arawn (also known as Donn), son of Mider. The Briton Lord Pwyll ruled here in Arawn's stead in Prehistoric times. Tir nam Beo, the land of the living set apart from Annfwn as a paradise for certain worthy souls favored by the Celtic gods. Note: The Starlight Citadel is the base of Brian Braddock, and formerly Roma and Merlyn. It exists within Otherworld on top of a small floating island. History: (Excalibur I#50 (fb)) - Merlyn came to Otherworld and established his base the Starlight Citadel, from which he created what would become the Captain Britain Corps to patrol the Multiverse. (Captain Britain Summer Special 1980/4-text) - Originally, there were twelve Walkers: Men of power who perceived the old paths, or "ley lines," connecting the points of magic from long before the dawn of time. The Walkers passed their knowledge onto those men wise enough to understand, many of whom became the druids. The Walkers also created routes from Earth to the realm known as Otherworld, usually by way of underground tunnels, allowing the inhabitants of both worlds to mingle together. However, six of the twelve Walkers were corrupted by the forces of darkness. They created false paths which led men to madness and death, usually via black magic. People became mistrustful of the old way, mainly because of these six evil Walkers. Witches were burned, creatures of Otherworld like faeries, elves, trolls, and dragons were shunned and scorned. The old paths were discarded, and a rift appeared between the two worlds. The remaining six Walkers, the noble or Proud Walkers, gradually withdrew from Earth, returning to Otherworld. The evil Walkers came to dwell in the Netherworld bordering on Otherworld.
? ?-After the fall of Camelot in the 6th Century, Merlin/Merlyn moved the body of Arthur Pendragon to Avalon. Camelot and many of its survivors were apparently relocated to Otherworld. (Official Handbook of the Marvel Universe I #15) - The Evil Eye was forged by the alchemists of Avalon. (Fantastic Four I#54 (fb) ) - Around the 12th Century, Prester John traveled to Avalon, where he marveled at its wonders. He was given the Evil Eye and the Chair of Survival. Avalon apparently vanished from the sight of men soon after, having been destroyed by the forces it once utilized. (Captain Britain I#1-2 (fb)) - Merlyn and Roma granted the Amulet of Right to Brian Braddock, transforming him into Captain Britain. They similarly gave the Sword of Might to Joshua Stragg, who became the Reaver. (Captain Britain I#33-37) - Captain Britain was brought to Otherworld by Merlyn for a conflict involving Nykonn. BTS - The Black Knight (Dane Whitman in the body of Eobar Garrington) was brought to Avalon as an ally of Amergin, the High Priest of Avalon. (Avengers I#225-226) - Escaping the Dark Realm to which they were exiled, The Fomore invaded Otherworld and ravaged the land, possibly forcing the Celtic gods out. The wizard Amergin brought the Black Knight's allies, the Avengers, through time to fight the Fomore and force them out. The Celtic gods returned to Avalon afterwards. (Hulk Comic (Marvel UK)#1, 3-21-BTS, 22-30, 43-55, 57-63) - In the modern era, Necromon, the leader of Netherworld, sought to overrun Otherworld. He realized that the forces of Camelot would rally against him, and so he sought to eliminate some of their greatest warriors. He erased the memory of Captain Britain, and sent his Mordred, one of the evil Walkers, to eliminate the current Black Knight. The Knight located the amnesiac Captain Britain, and the two were assisted against the Trolls of Netherworld by Vortigen, one of the Proud Walkers. Vortigen helped Braddock regain his memory, and led the two in a quest to Otherworld. In the course of the journey, losses occurred on both sides, but ultimately the Proud Walkers were gathered to fight against their surviving evil brethren. The forces of Necromon were defeated and the evil Walkers were either slain or incapacitated. Camelot was destroyed by the death-throws of Necromon, but Vortigen brought everyone to his castle to build a new Camelot. Presumably the Proud Walkers either dwell there, or have separated and returned to their homes. (Marvel Super-Heroes (UK)#377, 383; Daredevils (UK)#1, 2, 9, 10; [Mighty World of Marvel#8], 9, 11-13) - Merlyn and Roma manipulated Captain Britain into struggle with Mad Jim Jaspers and the Fury, which escalated out of control, resulting in the seeming death of Merlyn. The funeral took place in Otherworld, after which Roma took over as ruler. (Captain Britain II#4) - Roma observed Captain Britain's struggle against Sidney Crumb, an innocent man mutated into a monster by a toxin released from the corpse of the Fury. (Captain America I#305-306) - Modred the Mystic attempted to force Merlyn to reveal himself from Otherworld. Merlyn refused, and waited until Captains Britain and America overpowered Modred to appear, and he took Modred into custody. (Thor I#386-387) - The Asgardian god Thor pursued a griffin-like creature into Avalon where it killed a Danaan family. The Celtic gods Leir and Caber rehashed old feuds with him before coming to terms and joining to kill the beast. (Marvel Comics Presents#22/3) - A race of wolf people calling themselves the Tuatha De Danan brought Wolfsbane (Rahne Sinclair) to their realm in Avalon, and attempted to force her to stay with them. She escaped back to Muir Isle. (Marvel Comics Presents#30/4) The Fomore once gain invaded Avalon as Leir matched them in battle against the wishes of The Dagda. The Dagda, however, manipulated a swarm of insects to force a stalemate between the two forces. (Quasar#11) - Modred the Mystic managed to mentally possess Phoenix (Rachel Summers) and directed her to open a portal to Otherworld so that he could return physically to Earth. Quasar, who at the time was watching for alien presences on Earth, decided to investigate the strange behavior of the Phoenix Force, leading to a fight against the still mind-controlled Rachel and Modred. He was defeated but soon rescued by Rachel's Excalibur teammates Nightcrawler, Meggan, Captain Britain and Widget. The five heroes worked together and managed to banish Modred through another portal created by Widget. It is unknown whether that portal led back to Otherworld or to another dimension. (Excalibur I#43-BTS, 44-50) - Roma observed as Captain Britain and Excalibur battled Necrom (not Necromon) to defend Otherworld. At the conclusion of the struggle, Merlyn revealed that he was still alive. (Fantastic Four III#6-BTS, 7, 8) - Roma had the Fantastic Four brought to the Starlight Citadel, where they debated the need to terminate Franklin Richards, due to his potential threat to the Multiverse. (Heroes for Hire I#2, 8) - The Lady of the Lake granted the Sword of Light, Shield of Night, some armor, and the flying steed Strider to Dane Whitman, the Black Knight. (Excalibur I#125) - Roma and Merlyn observed the wedding of Brian Braddock and Meggan. (Excalibur II#1-4) - Mastermind (the computer) enslaved Roma and took over Otherworld, until he was defeated by the combined efforts of Roma and Excalibur. Following the battle, Roma gave Captain Britain the sword Excalibre and proclaimed him to be the new King of Otherworld. (Avengers III#81 (fb) - BTS, 79-81) - Morgan le Fay led her forces into Otherworld, assaulting and capturing Braddock and Meggan. She intended to use Thor's arrows to transmit Braddock's injuries onto the nation of England, but Braddock transferred the title of Captain Britain to Kelsey Leigh, who defeated and banished Morgan and her forces. COMMENTS: Avalon adapted by Stan Lee and Jack Kirby, Otherworld by Chris Claremont, Herb Trimpe, and Fred Kida. 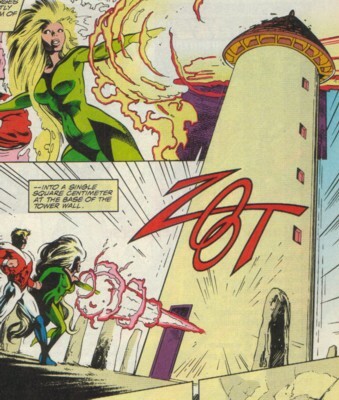 Both of the following images are from Excalibur I#50, one of only two issues we see the Otherworld version of the lighttower in, and the only one we see it clearly in. Image 1 shows the tower about to be destroyed, but damage aside is the best clear view. Image 2 shows what's left of it now (not a lot), and shows the paving and standing stones that ringed it. In Excalibur I#50, Merlyn claims to have created Otherworld. The time period of the flashback is not given, and since he has lied and manipulated others before, this remains unconfirmed (and in conflict with Celtic Mythology). I never really recorded the appearances of the dimensions, so I'm sure I missed a bunch, let me know what I missed, and I'll add it. In fact, the whole entry is almost certainly missing quite a lot. Again, let me know, and I'll add it. The Dark Elves of Svartalfheim (one of the nine realms of Asgard) have been described as the Faeries. The exact connection between the Dark Elves, the Faeries, Svartalfheim/Asgard, and Otherworld is as yet undefined. The Evil Eye (used by Prester John, also the power item in the first Avengers/Defenders war, etc. ), @ Fantastic Four I#54, originates from the Druids of Avalon. There are a bunch of dragons of unknown history (such as the one from Excalibur). Some of these may be from Otherworld. 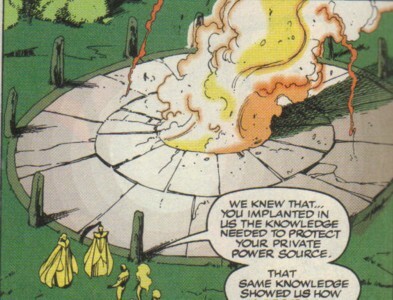 A portal to Avalon appears in Generation X#37. Saturnyne, Opal Luna Saturyne, has several other dimensional counterparts from which she should be distinguished.